Earlier this week, I took delivery of Suzuki’s V-Strom 650XT and from my first impressions after clocking up 230 miles over the past few days I can tell we’re going to get along. As I explained the other week, I opted for the V-Strom in the hope of a compromise between practicality for the hefty daily commute and fun factor for the off the cuff, ‘I’ve got a spare few hours’ ride. It effortlessly chews up the motorway miles, which is good considering 50 miles of my 68-mile commute is along the A1. 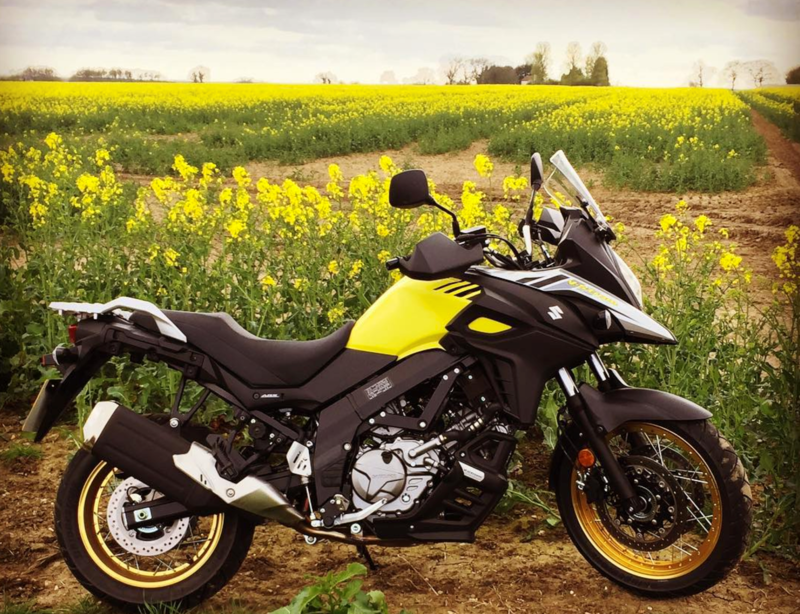 It’ll comfortably sit at a steady motorway speed yet it’s always reassuring knowing you’ve got the extra punch to get past something if needed, which is something my 2016 long termer – Honda’s NC750X – was lacking. It’s really comfortable too, after half an hour in a straight line on the Honda my arse would go numb, but I’ve not noticed that so far with the Strom. Yesterday I headed out for my first proper blast for fun, and I’ll freely admit I was rusty as hell for the first 20 miles but once I got back into it and started to get used to the bike it was a right ball. The 71bhp v-twin from Suzuki’s SV650 (slightly detuned) is pokey enough to launch the V-Strom out of corners and you don’t really notice the reasonably heavy 216kg weight when riding (you do when pushing it around!). And that's with at least trying to be mindful that I'm running it in for the first 600 miles! I’ve not ridden with traction control much and wondered whether a 650cc 71bhp bike needs it. It’s three stage, off, stage one and stage two. It’s adjustable on the fly with controls on the left handlebar, all you have to do is close the throttle as you change. However, flick it into stage one and this is where the system excels. This option allows a reasonable amount of spinning up before engaging, and when it kicks in this time it’s almost unnoticeable. You’ll see the TC light flickering on the dash, but you can’t feel the cut in power at all. I had wondered whether I’d be better off with a bike like Web Producer James’ Kawasaki Ninja 650 for the afternoon blast through the Lincolnshire wolds, but the V-Strom is holding up well so far and is much more comfortable for the long commute!